This summer I needed a project. I am a project person. I decided that it was time to redecorate my living room. I have never really liked my living room. It always felt too dark and heavy. As a result I never spent much time in there except for holidays. I decided it was time to lighten up my life! The whole new living room reveal will come later but today I am excited to share the transformation my piano underwent. Our piano is old. I’m not exactly how old it is but when we bought our first home back in 1986 it was in the house. We paid the owners who were moving into a retirement home a few hundred dollars for it. It has been a great piano for our family. All of our children learned to play the piano on it and many a Christmas carol has been sung around the piano. But it was just too big and dark for my new lightened up decor. Since there are no kids at home any more, I rarely play and the only time it seems to get used is Christmas Eve I thought about getting rid of it. I had a small revolt from a few of my children, one in particular who considers it his piano since he is the only one that still plays the piano. So I decided to keep it but something had to change. I decided that painting it was the solution. That same child who revolted against me selling the piano also wasn’t too happy about me painting it either but oh well! I have to admit it did seem a little “sacriligious” to paint the piano but I decided to do it anyway. Deciding on the color was the hardest part. After a little research I knew I wanted to use chalkpaint. I love the fact that there is no prep work with chalkpaint. No sanding, no priming all you do is paint with the chalkpaint! I used Annie Sloan Chalkpaint which can be bought at two different places here in Portland that I know of. I purchased my paint at The Purple Pear in SE Portland. The owner was very helpful and she even gave me samples of different colors to take home. She also sells the paint online. There is also another shop in Hillsboro that sells Annie Sloan Chalkpaint that I have purchased from before also called B Designs Home Decor and the owner is great too! I ended up chosing Provence diluted 4 to 1 with Old White. The process was easy. I removed the front of the piano first. This was the only part of the piano I took apart. It came off easily by releasing some levers. I also taped around the foot pedals and the keys. And then I just started painting. I did paint the piano bench first because I decided if I hated it I could just buy a new piano bench! I decided I loved it and then I just went for it!! I was a little nervous putting that first brush full of paint on the actual piano. Here it is with the first coat. I ended up putting 3 coats on since the piano was so dark. After the third coat I lightly distressed the edges and then put a couple of coats of the Annie Sloan clear wax on it. There are lots of YouTube videos out there on how to apply the wax. And here is the finished project. Isn’t she pretty!! I have to say I am totally in love. It is so pretty now, I’m inspired to sit down and play! Someone asked me if painting it changed the tune of the piano. My reply was that unfortunately it was still as out of tune as it was before. Need to get a piano tuner over here! Hi – I’m Leigh Anne! I have been a homebased mom for 30 years since my first baby boy was born! I love working with women and helping to inspire them to achieve their goals and dreams while still maintaining motherhood and family as their number one priority. I blog about everything I enjoy – creating treats and meals in my kitchen, spending time in my garden, entertaining and party planning, reading, self improvement and tips and ideas on style and fashion. Leigh Anne, this is simply awesome! I’m not familiar with chalk paint. Would you explain a little about it? What can it be used on? And how is it that you don’t have to do any prep? Will it adhere to any surface – paint? varnish? plastic? laminate? It is amazing! You paint directly on your surface, no prep, no prime, no sand!. I have used it over varnish, stain and paint but not plastic or laminate so not sure about those two. 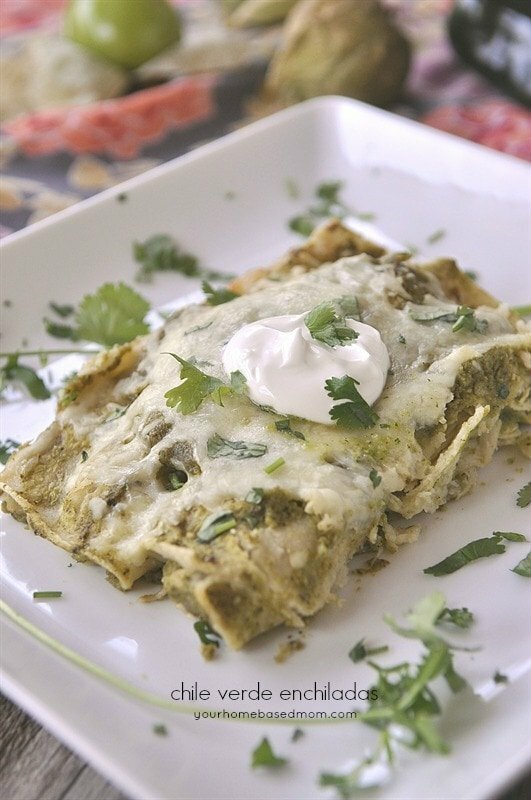 here is the website that has lots of great info: http://www.anniesloan.com/ I would google and see if there is someone in your area that sells it and they should be really helpful to answer your questions. Love your piano transformation and the sneak peek of your living room…they are beautiful! 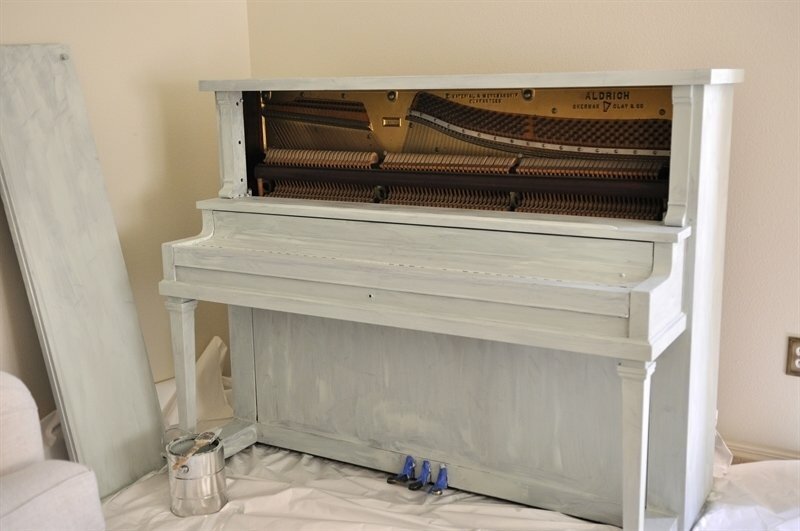 I’m wanting to try some chalk paint, in the photos is the first coat we see in the photos the same color as the finished piano. It almost looks white? Thanks for sharing, love your blog. Patti, Yes the first coat is the finished color. I used the same paint for all three coats. It just looks lighter because of the dark wood showing through and part of it might be the angle of the camera too, more light. Brave girl!! I had no idea you did it yourself. I hyperventilate at the thought. The other one I saw done, they hired some painting crew to do it. I definately want to do it some day. It was so much easier than I thought it would be. Using chalk paint really simplifies the process. I inherited a very old piano from my grandmother and no one seemed to know the history. We got the serial number out of the inside of the piano and called a piano dealer in the area. They were able to look it up in the catalogs. If you’re curious to find out a little more of the history of your piano, that would probably work for you too! I found out mine was made in 1905 in New York. Love that – I’m going to look for a serial number and see what I can find out. I looked for a date somewhere on the piano but couldn’t find one. Thanks for the tip! Cute! Does it make you want to play the piano a little bit more now! 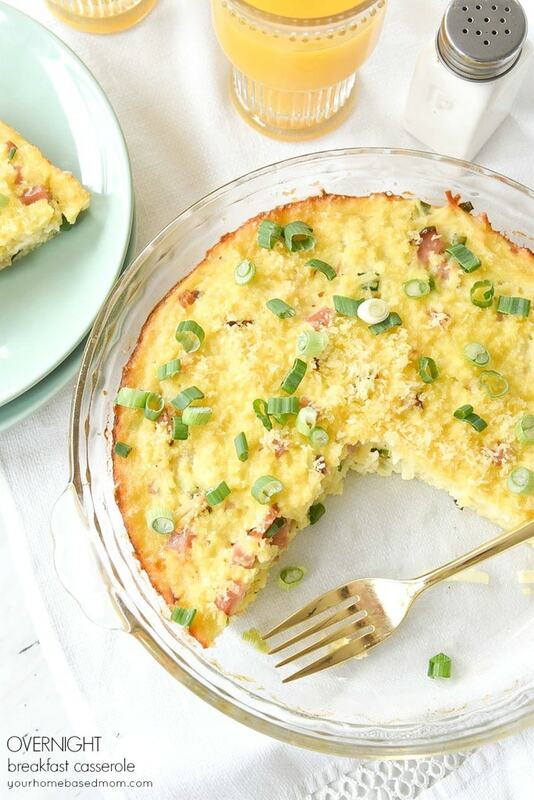 The dishes on top or cool too. PS keep us posted on what you find out in regards to the serial number – could be super old! PPS Post a video of your Son when he plays on it for the first time! So fun! I cannot imagine anyone being unhappy abut the results of the painted piano !! it is gorgeous and inviting. bet it will look quite nice with the Holiday décor too. I can see a crèche on there for sure. It would be nice for a follow up on the kids reactions. I must try the chalk paint. Is the wax finish the only recommendation for protecting the surface or would other clear coats work too ? You are so right! I have a pretty white creche that is going to go on top of the piano! I’ll be sure and report back at Christmas on the kids!! Annie Sloan has their own wax and that is what I used. Do we get to see the new living room? I walk by mine too and wish I had the inspiration to update it!! Kris, You will get to see the whole room eventually!! I love it! 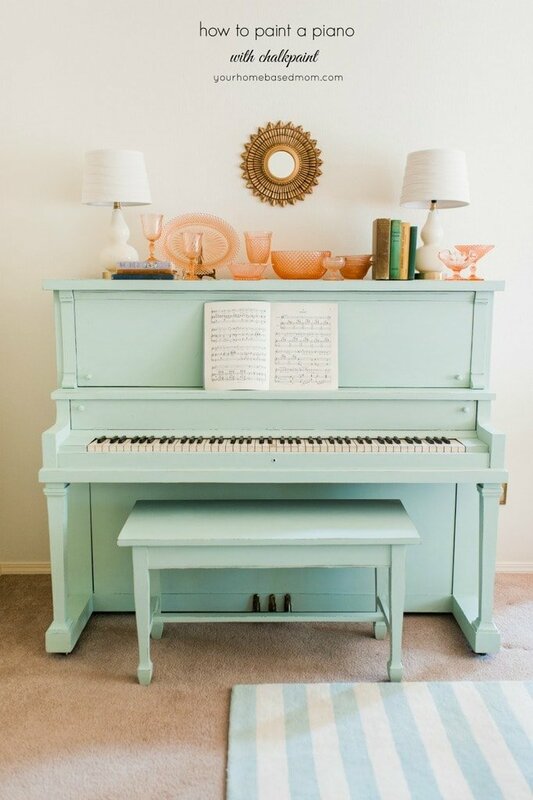 I’ve been debating on painting my piano and I think this is the exact color I want! I’ve used Annie Sloan before, and I love it. How much of each color did you use? 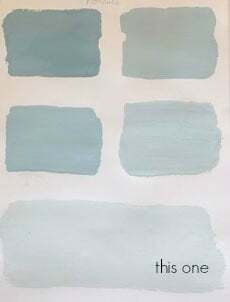 Since I used 4 to 1 I bought one container of the Old White and then one sample size of the Provence and added it together and it was the perfect color. It turned out so incredible! And those orangey glass bowls are the perfect complement. Can’t wait to see the entire room reveal! I am in love with this color! You did an amazing job! Pinned! Gorgeous Leigh Anne! I love the color you chose – and I love that you’ve given something old new life! SO so beautiful!!! My husband is not down with the painted piano idea. He is the one that plays it, so I don’t push too much. Jim was skeptical but he loves it. WOW- absolutely, positively GORGEOUS!!!!!! I love the piano this color!!! You did a fantastic job and I can’t wait to see the entire room , I am sure it will be just beautiful! Thanks Liz, I am totally in love with my new room and can’t wait to share the whole thing. If I ever get a piano I am so doing this! Thanks for the tips about the chalk paint. I hate sanding. Your picked the most perfect color. I love it! Thanks Elise. It was so fun to do! I love this! I have bought the chalkpaint to do my piano. The only problem is that is has some type of fabric on parts of the piano. I don’t know where to get that replaced. Nikki, Not sure either – you could possibly call a place that fixes up old pianos and ask them. I absolutely love your blog!! 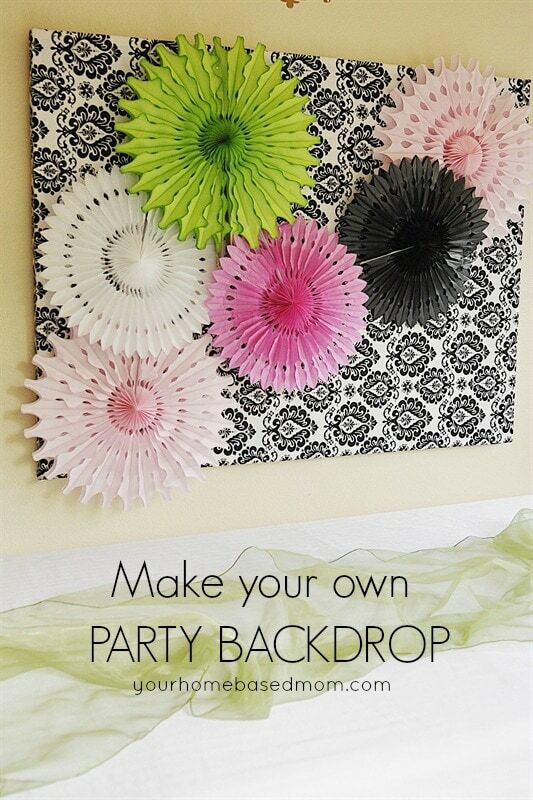 This has inspired me to be so crafty, and as a mom to be I can only aspire to be as crafty of a stay at home mom as your have been. THanks Amy. I am so glad you enjoy the job and that you find inspiration here. That means a lot to me! 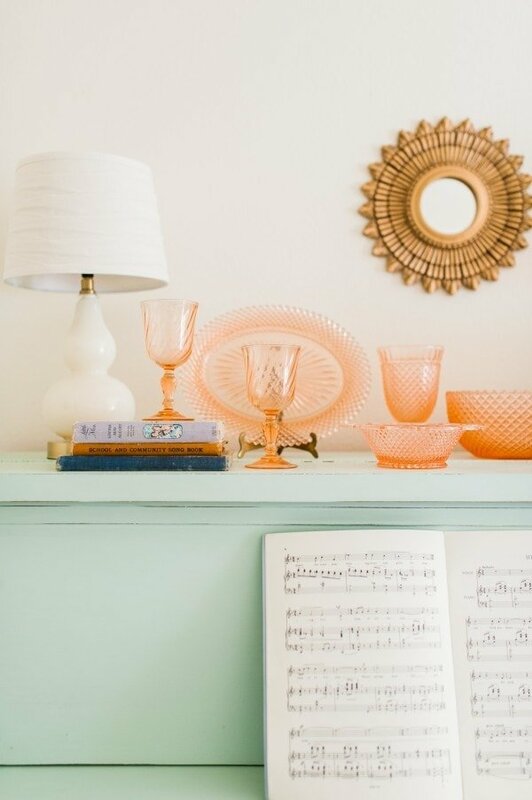 I love this color and how you put that orange colored glassware ontop, really pops! great style. Thanks Ashley. The depression glass was from my mother in law. That has to be the prettiest piano I have ever seen! Love the color! Awesome job! Thanks Sharon. I love it!! Hi! I just came across your painted piano on The DIY Dreamer and it stopped me in my tracks. GORGEOUS!! Thanks so much Stephanie. I find myself going into my living room several times a day just to look at it – love it so much! Do you think the paint would work on kitchen cabinets as well? Kind of scary, but your piano looks great ! I have used it on dressers and other furniture but not cabinets but I don’t see why not. Thanks! Where did you find the mint green rugby rug? I’ve been looking for one just like it. Thanks. Thank you for posting your piano transformation! 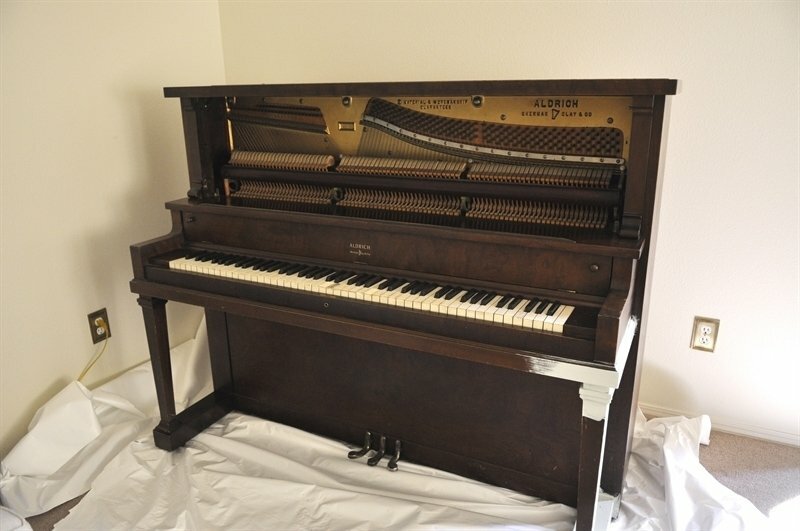 We have an old upright with a similar color as your “before” picture. I’ve been wanting to redo it for a long time and this is my inspiration! I love the Provence color chalk paint, too. Thank you for giving me the courage to take the plunge! So glad you liked it! I love, love my painted piano and totally recommend it. Take the plunge!!! What was the best way to dilute the paint to get the color you wanted? I added the blue colored paint into my white. I used an equal proportion so that if I needed more paint later I wouldn’t have to worry about matching it. Jenn, It didn’t take as much paint as I thought it would. My memory is a little vague but I’m pretty sure I only bought one quart and added one sample size can into that to get the color I wanted. 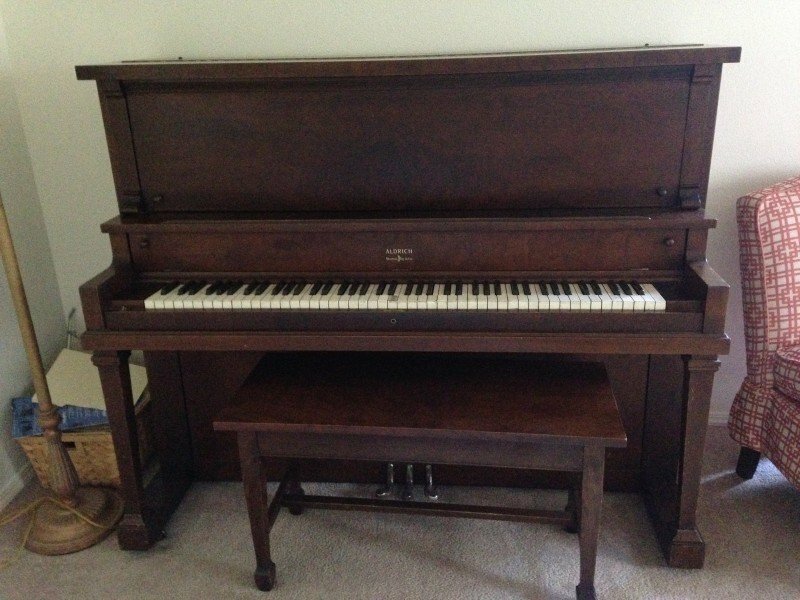 I’m about to embark on the same project… My piano is the same size as yours and I want to make sure I buy the right amount of paint. How much did you end up using? Thanks! Looks great! My friend gave me a small upright piano – I’ve got it all taped off and ready to go, even added some wooden appliques. Sent my hubby to pick up the Annie Sloan paints for me… I’m so excited to do this! Thank you so much for the tutorial; it’s going to look fantastic! Have fun! I love my piano. What color are you painting it?? Curious. Does the chalkboard paint leave it feeling grainy like a chalkboard? Hi ! What a surprise I had this morning, seeing your piano on Pinterest. We have the exacte same piano at home, the carving and everything. We are living way apart (Montreal, Quebec, Canada) and have the same piano ! It came at my parent’s house when I was a little girl (early 70′) that same color that yours is today ! Under the paint we can see the dark brown color. When it was move to my own house we had it tuned et learned that it was built in 1918 but don’t remember where. So a century to celebrate soon ! Time to start to play again don’t you think ? Enjoy ! How fun that we have the same piano. I agree that it is time to start playing again!! 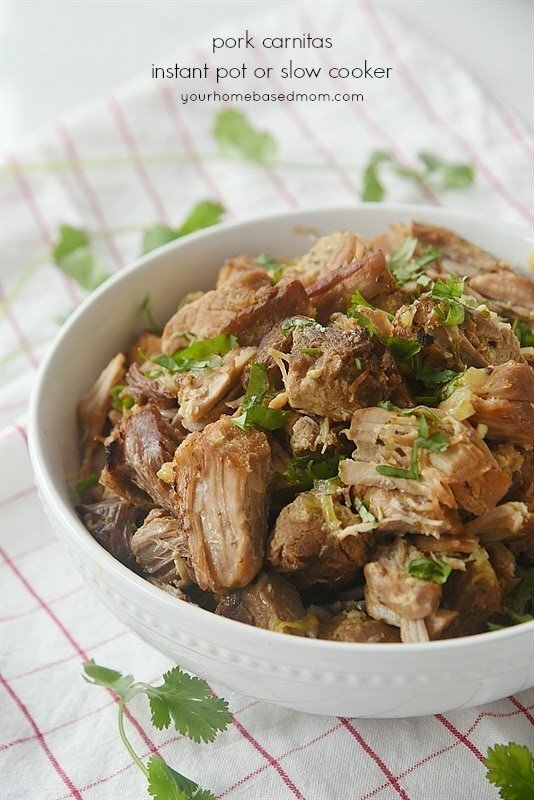 Hi, I just found this on pintarest. I see you posted this a while ago. But, this exactly what I am looking for. 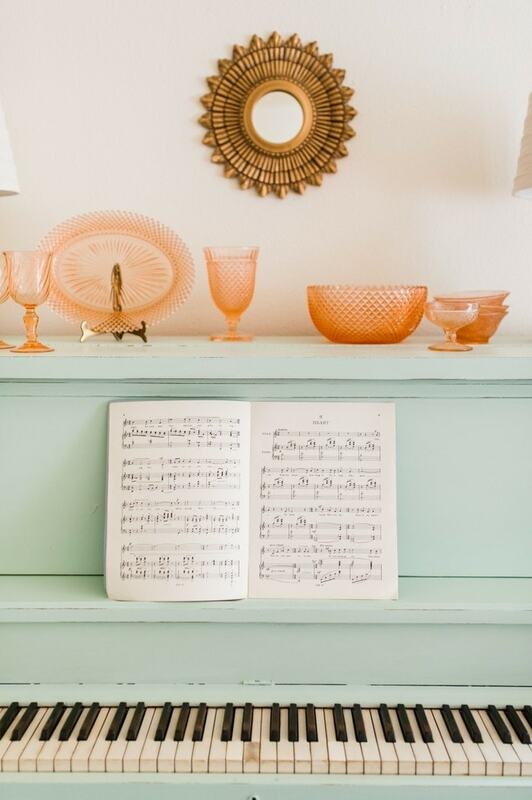 I want to paint our piano mint green. I want to use chalk paint because of the not prep work. I just couldn’t figure out how to find the perfect color. And I don’t know if there is a missing step in your post. Did you do three layers of white and then on the provence? I diluted the provence 1 part provence and 3 parts white. Hi! I’m doing this with my piano now!! Was one full size of white and sample of green enough for all 3 coats on your piano? If not, how much did you use? Yes, it was enough for the whole piano. Love the piano. Where did you get the cute rug? Looking for one just like that!! this is awesome!!! !I’m thinking of painting my piano lately and after seeing that I’m sure I will give it a try! I recently discovered chalk and have repainted everything from my pantry, to the patio set on the balcony, and my husband’s reading chair! The next step is definitely our old piano. I was thinking yellow or blue. Yours look amazing – I hope I can do as great of a job! I was wondering, did you have to take all the keys out… or simply the bigger parts?Or did you just tape the pedals and go for gold? I just taped off the pedals and went for it! Hi I would I’ve to paint my piano the same color as yours. I just need helping getting your color, you said it was 1 quart of white and a sample of Provence? Or you said something about 3 parts white what does that mean? Just need help getting it right before I start painting thank you!!! 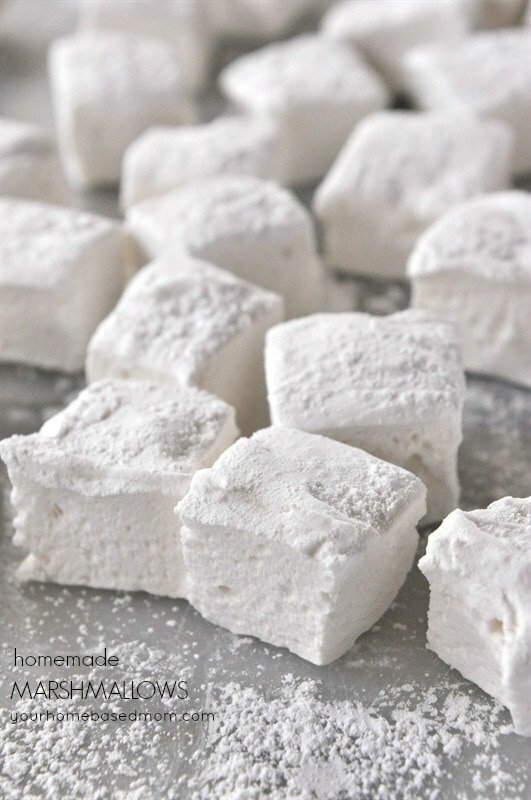 Angie, yes I used one quart of white and one sample of Provence. Have fun! I see it’s been 2yrs since this project..how is the chalk paint holding up?!! I’m wanting to do my kitchen cabinets. It’s holding up great but the piano doesn’t get near the wear and tear that kitchen cabinets would. 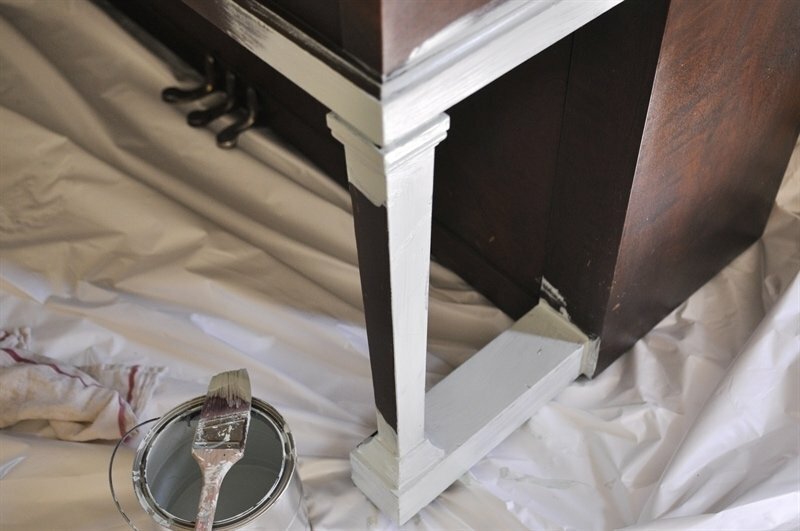 I’m doing the same thing with chalk paint but the pure white- I’ve done 2 coats and I can still see the orangy wood. I may need to kilzn a little before the 3rd coat. I wonder if the green paint help keep the wood bleeding through? Bev, Are you using Annie Sloan chalk paint? I absolutely love this!! I am doing this to my piano this year….can’t wait till I get it done. 🙂 I already have the wall above it finished, I framed old sheet music, and formed a collage!! I keep looking at it and loving it!! Thanks so much! I love the idea of framing old sheet music. Have fun with the process! But now the piano lost all its value and it’s going to sound like crap…. 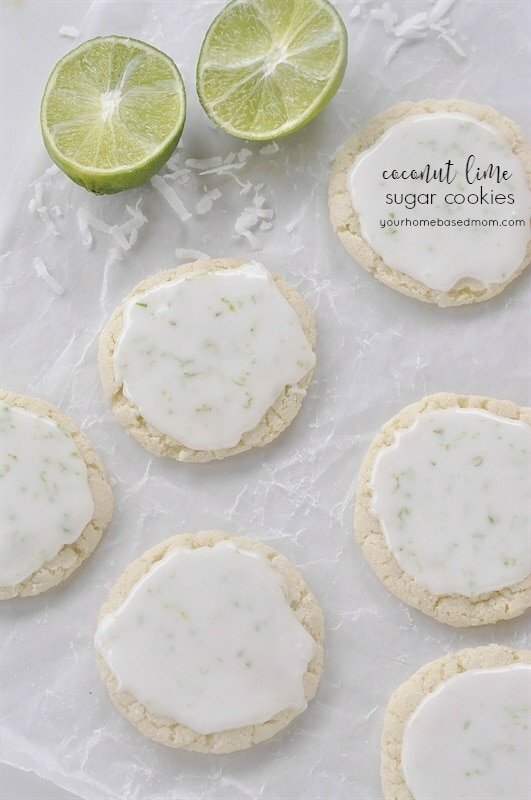 Just to look nice on Pinterest…. Julie, Actually, the piano sounds just fine and I only paid $200.00 for the piano. We love it! I would love to try this on my piano after seeing how beautifully yours turned out! Your post really inspired me, but in all honesty, I am not a crafty person, and the thought of this scares me…A LOT!! Do you think someone of an extreme beginner skill-level could pull this off?? Also, now that you’ve had the paint on for a while, how is the finish holding up?? Jewels, The paint is holding up greate and all you really need to be able to do is work a paintbrush for this project – no crafty genes required. You can do it! Start with the piano bench first, it’s good practice and easier and if you decide you don’t like it, all you have to do is replace the piano bench! About how long did it take you? How much paint did you have to use? How well has it held up? It’s beautiful! Lexi, It went a lot faster than I thought it would, probably total a couple of hours. I used a quart of paint and it has held up beautifully! Hello! I’ve done chalk paint (and some milk paint on my fireplace) quite a bit before, but not on my piano. We appear to have the same piano style, and I’m wondering (can’t tell from the pictures) what you did about the hinges that run along the top and the key cover? Try and tape, or paint right over them? I’ve got all my supplies and am anxious and excited to get started! Kara, I painted right over them. Have fun! When you painted the area around the keys, underneath where the cover slides back, did you remove anything else? Did you just tape off the keys? I had to laugh when I saw this piano online. A few years back I also painted my piano….in a similar color. Mine has a little more color and less gray. My story is a little sadder than yours, though. Mine sounded pretty good, although it’s ancient, as it is an upright baby grand; but after dragging it across the living room (I was also sanding and painting the floor. ), putting 2 coats of primer and 2 coats of paint on it and moving it back in place (after the painting on the side of the room where it was previously located was done, as well), it started to “lose it”. Now a have 2 broken notes (that I didn’t have before) and it doesn’t sound at all like it did. I don’t know if it was the paint or the move. So, whereas before I had a rough-looking piano that sounded pretty good for its age, I now have a pretty piano that sounds awful and has broken notes. I’m not sure I gained anything for my efforts…except it does light up that corner of the room! This is gorgeous! Is the color in the pictures pretty true to the color in person? Also, how long did the painting take?